Adding remote on/off functionality to electronic projects is now easy and cost effective with RF Solutions’ RDF1 single board receiver/decoder modules, available from OKW Electronics. The RDF1 provides superheterodyne FM receiver decoder functionality in one easy to install unit - making it ideal for a wide range of remote control, telemetry and RFID applications. These CE compliant units have a range of up to 200m/656ft (line of sight). 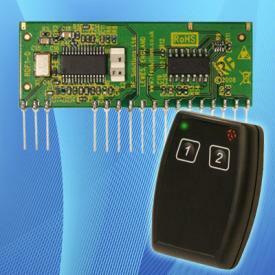 They feature up to four digital outputs and one serial data output. Each RDF1 module comprises a front end superheterodyne receiver and an embedded microcontroller which decodes the RF string for a compatible transmitter. They have an easy-to-use learn facility and can store up to 40 pairings within the internal non-volatile memory (EEPROM). RDF1 operates on the 433.92 MHz frequency. The supply voltage is 5 V; the current 7.8 m/A. Units can be deployed within a temperature range of 0-60° C.
The RDF1 has been designed to be used in conjunction with RF Solutions FIREFLY or HORNET handheld/key fob transmitters. The FIREFLY Series is a slightly larger, more robust range of 433.92 MHz handheld transmitters with either one (-TX1), two (-TX2) or four (-TX4) switches. They are suitable for remote switching access control applications such as electric gates, hydraulic pumps, security doors plus various lighting systems just to name a few. FIREFLY has a range of 150m/492ft (line of sight) and can operate in temperatures of -10°C to 50°C. The supply voltage is 3 V (a CR2032 cell is provided with each unit). All three units in the range are 3.54” x 2.13” x 1.06”. Each FIREFLY TX kit includes a handheld transmitter, lanyard and wall mounting cradle. The HORNET Series is a smaller, yet ruggedized system of 433.92 MHz FM key fob transmitters designed for general remote switching where an unobtrusive and compact remote control unit is desirable. Both FIREFLY and HORNET have FCC Part 15 Class B digital device approval.